Hideo Kojima (you know, the creator of Metal Gear) has tweeted a photo of Yoji Shinkawa holding an unfinished prototype of a Play Arts Kai Metal Gear Solid Psycho Mantis. Discuss on the Toyark Forums› Views: 5909 › Credit: Specter of the Toyark Forums! 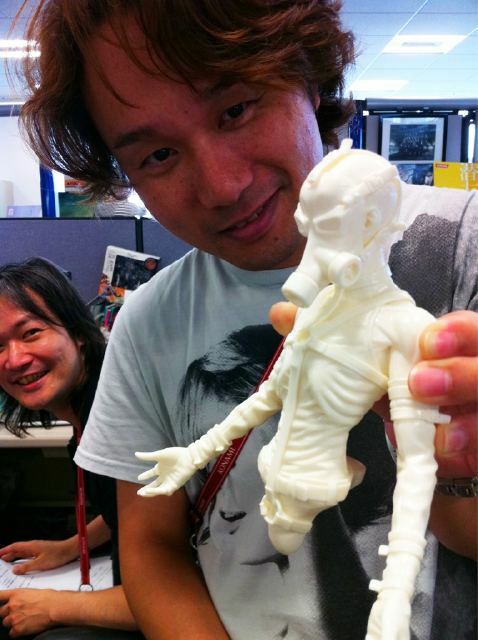 An image of Yoji Shinkawa holding a pre prototyp of Psycho Mantis was twitted by Hideo Kojima. Same way we found out about Fox and Snake. I would have liked Meryl first or even Sniper Wolf and Liquid but its ok Mantis is more unique and classic. Wowwwww never thought we'd see this guy in this line. Man am I going to have to buy every MGS1 Play Arts Kai? Is this guy from metal gear? oh my... I wanted him and didn't expectd him. Looking forward to more photos. Oh man, while some of the games in the series might've surpasses 1, MGS is the most memorable for me! Can't wait to see more....Mantis had a unique boss fight for the time. Yeah, Metal Gear Solid on PS1. oh my geezus, I have to have all of these. Please tell me they're gonna make a Sniper Wolf and Vulcan Raven. Cool. Can't wait. I wonder if Mantis can also read your mind and tell you how many figures are in collection like he did in the game. I'm really looking forward to a Grey Fox/Ninja and Solid Snake though. Then I can die a happy man. But really though, forget all of these characters I need RAIDEN.